You are looking at a professionally printed 12x18 movie poster photo autographed by the cast of STAR WARS: EPISODE IV. 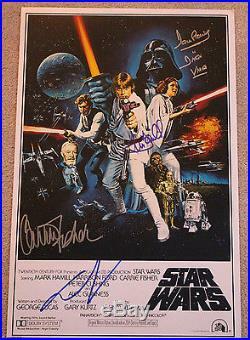 The poster is signed by the following cast members : GEORGE LUCAS (DIRECTOR) MARK HAMILL (LUKE SKYWALKER) CARRIE FISHER (PRINCESS LEIA) DAVE PROWSE (DARTH VADER). THIS POSTER HAS BEEN SIGNED BY THE CAST AT VARIOUS DIFFERENT EVENTS. SPECIFIC LOCATIONS WILL BE GIVEN TO WINNER UPON REQUEST. The item "STAR WARS EPISODE IV A NEW HOPE CAST SIGNED 12x18 MOVIE POSTER withCOA X4 PROOF" is in sale since Saturday, October 08, 2016. This item is in the category "Entertainment Memorabilia\Autographs-Original\Movies\Photographs".